Pattern Imprinted Concrete Driveways Located in Dublin, Kildare, Meath. Individuals who are looking to dramatically improve their home and make it more attractive and stylish, constructing a pattern imprinted concrete driveway can give them a desired result. The method includes imprinting the area of freshly poured concrete to add a look of timber, cobbles, slate and stone decking. The best thing about pattern imprinted concrete driveways Ireland is that it will look the same even after 15 years of its construction. Besides, concrete being a very sustainable material it will have very little effect on the environment unlike other building materials. At Pavelink Driveways, professionals work to add creativity, color and texture to a mixture of sand, cement and water to make concrete driveways Dublin more aesthetically pleasing. We are a specialist in imprinted concrete installment, blending tradition with innovation for years. We make concrete on our site, using advanced formula that provides durable surface. We will assess your property’s surrounding to figure the right design for the surface. To ensure a successful installation of imprinted concrete it is important to choose a pattern that will bring out the best. Our concrete pavers are always there to assist you in the selection. 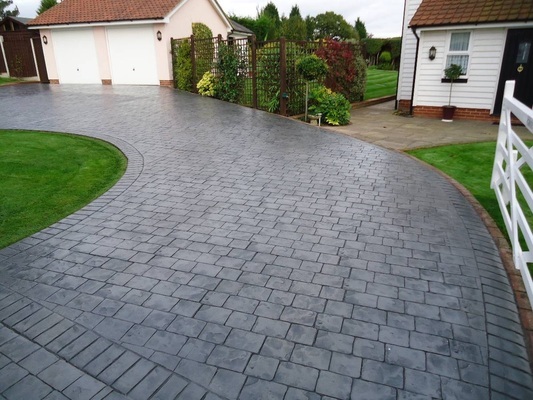 At Pavelink Driveways, you get to choose from a wide range of options. We realize how important it is to use the apt method for coloring the concrete. Our team of experts, therefore, puts in the most groundbreaking technology for the task. Usually, you will be provided with a color chart to choose from. Also, we can provide you with samples. When it comes to installing imprinted concrete driveways, the border design plays an essential role. However, the correct edging for your driveway depends on the pattern you are choosing. We make sure that your driveways, patios and paths are durable, unique as well as virtually maintenance free. Since we offer so many design and color choices to our clients, creating driveways that are truly original is easy. As for our imprinted concrete cost, we have tried to keep the charges pocket-friendly. You can opt for a granite pattern concrete imprint, including borders if you have a two-story brick house. The main concrete areas can be painted with a sand color hardener, whereas the decorative edges can be custom colored to match the trim and shutters of your home. Send a mail to know your concrete driveway cost for such designs. A broom-finished imprinted concrete Ireland installation can be a good idea too, while stamping the driveway’s edges with a brick-styled border. For an interesting finish, we can use a burnt crimson shade for the border. If you wish to get more ideas for your stamped concrete driveway, speak to us now. We can even give you an approximate imprinted concrete driveways prices quotation. If you need a gravel driveway, sealing products or just some groundwork we are ready for you.